Why Am I So Tired? 5 Tips to Increase Your Energy - The Co.
Dear Co-it-All: My mom's trying to dump all my old stuff at my tiny apartment! If you’re anything like me, you have some super sluggish days from time to time. It happens due to a lack of energy and it’s not a good feeling. Sometimes it even comes way before the afternoon slump and you just can’t kick it. Why is this? Why do we sometimes feel so tired during the day even if we’ve had a good night’s sleep? It’s all in the nitty gritty of our lifestyles. Don’t worry, I’m not going to tell you to chug back an energy drink or multiple espressos. Sure, coffee helps with alertness, but then there are those jitters and that dreaded crash, and we end up worse off than when we started. There are natural ways to boost your energy levels so that you can more efficiently and happily go about your day. Being inactive (aka sitting in a chair at your desk all day) makes you feel more tired than doing some light physical activity, switching up your breakfast can be a major game changer, and did you know that dehydration results in fatigue? If you battle sleepy days and ask yourself ‘why am I so tired? 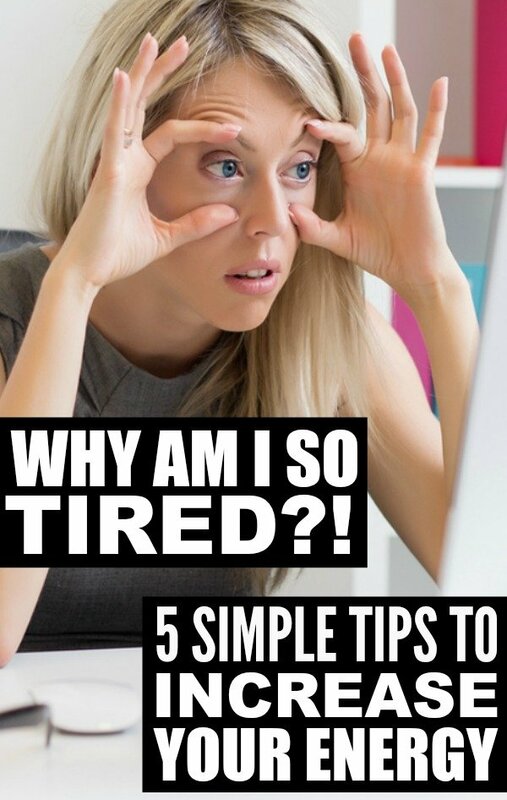 !’ on the regular, here are 5 reasons you are probably feeing tired and how to fix them. As your mother always told you, breakfast is the most important meal of the day. It’s true, and what (and how much) you eat for breakfast can have a major impact on your energy levels throughout the day. If you eat too much, you’ll likely feel sluggish; if you don’t eat enough, you’ll also feel tired because you won’t have the proper amount of energy needed to sustain you. Eat a balanced breakfast that’s high in whole grains, fruits and vegetables, and some protein for the best energy boosting effects! Many people spend the bulk of their day sitting in a chair at their desks, and it’s tiring! How is that possible? Well, if you sit for too long, your body gets pushed into “idle mode” and your lack of movement lowers the amount of oxygen flowing to the brain. If you’re not able to workout on your lunch break, at least get outside and take a brisk walk. Even walking for ten minutes can boost your energy and concentration for the next few hours! When you’re dehydrated you’re very likely to feel tired and sluggish. Sometimes we don’t even realize that we’re dehydrated and we go the whole day with our bodies just craving more water! When you’re dehydrated, toxins are held in the body and it increases water retention. Try your best to get the recommended 8 ounces each day so that you feel energized and your body can function at its peak! What we put into our bodies has the greatest effect on how we feel throughout the day, and if you load up on sugar-filled foods and foods packed with simple carbs (found on every fast food menu) then you’re likely to feel extremely sluggish. The reason? Carbs spike our blood sugar, and the increase followed by a quick drop causes fatigue. Keep your blood sugar in line with protein-rich foods like chicken and salmon, along with whole grains like brown rice. And if you rely on coffee to get you through the day, that’s no good either. It’s fine to start your day with a cup of jo, but wane yourself off mid-afternoon so your sleep schedule isn’t disrupted. It’s good to have routine and stability in your life, but if you live the same day over and over again, it can start to feel boring and unfulfilling. When our brains are put into auto-pilot it can lead to a lack of motivation and negative feelings of being drained and tired. Make sure to switch it up and try new things! Grab coffee with a new friend at work, try a new class at the gym, make a new recipe for dinner. These are all things that can get you out of a rut! If you found these tips to increase your energy helpful, please share them on Pinterest! And if you’re looking for more health-related tips and tricks to keep you at your best this year, please follow our Health and Fitness board where we share all kinds of inspiration! Energy Booster, Energy Boosters, Health, Healthy, Healthy Lifestyle, How to Boost Your Energy, Reasons You Feel Tired, Tips to Boost Energy, Tips to Boost Your Energy, Tips to Increase Your Energy, Wellness, Why Am I So Tired? This is an excerpt from the article Why Am I So Tired? 5 Tips to Increase Your Energy which originally appeared on http://www.cloudywithachanceofwine.com/.